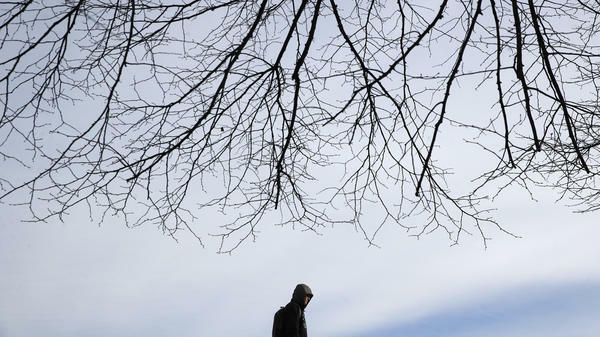 A man walks beneath a tree in Baltimore Wednesday as temperatures remain stubbornly below freezing. 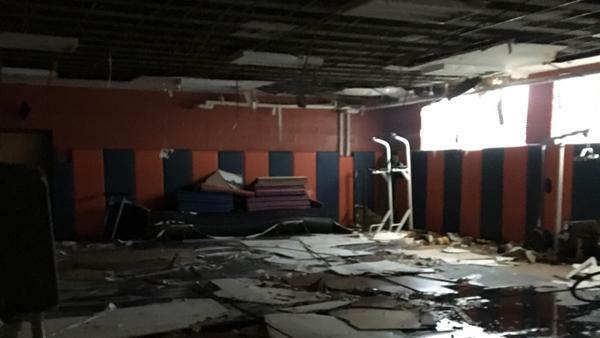 The wrestling room at Fredrick Douglass High School in Baltimore after pipes burst. Teacher Derek Bosshard says a handful of classrooms at the school are in similar condition. Nikki Massie's 16-year-old daughter goes to Baltimore City College High School — a public magnet school. It's one of that state's highest-performing high schools. "She actually said she couldn't feel her feet at one point," she said. "I texted her back and said are you joking? She says — no." Massie said her daughter has been in the building when it was cold before, but that this week felt worse to her. "I told her to tough it out and get home as fast as she could," she said. At Frederick Douglass High School, senior Dennis Morgan said Wednesday he was freezing. "As of now, I have on four shirts, two hoodies, and a jacket," he said. "It's kind hard to get comfortable when you've got so many layers on and you're not used to it and you're still cold." He said teachers are sharing their scarves with students. A burst pipe and fallen ceiling tiles destroyed numerous MacBooks and technology equipment at that school. Students there were dismissed early on Wednesday. On social media, teachers and parents posted photos of students wearing winter coats inside and thermostats displaying temperatures in the 40s and 50s. In a letter to the BCPS president Wednesday afternoon, the Baltimore Teachers Union called school conditions "unfair" and "inhumane" and implored officials to close schools for the remainder of the week. The organization said it had received "several" calls citing lack of heat. In a statement, Baltimore Public Schools said buildings had been monitored for heating or plumbing issues during the holiday break and that "numerous problems" had been identified and resolved then. "Unfortunately, with the extreme temperatures, new problems can emerge quickly," the statement continues. "Our priority is always to open buildings whenever possible. We want students to have every possible opportunity for teaching and learning, and we also want to make sure that students can get the services and supports that many families rely on — for example, warm meals and before- and after-school care." BCPS also said it relies on principals to relocate or combine classes when parts of a school have heating or plumbing problems and that "only when problems affect large portions or all of a building do we make the decision to close the school. This occurred with the schools that were closed today." City Schools CEO Sonja Santelises reiterated on Wednesday on Facebook Live that the operations team worked through the holiday break. "We had some schools that were colder yesterday but were warmer today," she said. "The challenge was we had new schools today that were facing heating challenges." Baltimore Mayor Catherine Pugh said she has no say in whether schools are closed, citing a 1997 deal that gave the state oversight of the city's public schools. Gov. Larry Hogan said the city's public schools had received "record funding for three years," WBAL reported. Calling the conditions "unacceptable," Councilman Zeke Cohen said he would "fight until my last breath for our schools to get the funding they deserve." Copyright 2018 WYPR - 88.1 FM Baltimore. To see more, visit WYPR - 88.1 FM Baltimore. Temperatures inside many schools hovered around 40 degrees. That's because a lot of these schools are in bad shape. They've got ceilings that are falling in, some pipes that are bursting. Mary Rose Madden from member station WYPR reports that parents, teachers and students are angry, they are confused, and they are cold. MARY ROSE MADDEN, BYLINE: Nikki Massie's 16-year-old daughter goes to one of Maryland's crown jewels, Baltimore City College High School. Built in 1839 with Gothic architecture, it looks like a castle. And it had very little heat this week. Massie says she was at work on Tuesday and started getting texts from her daughter. The first one said it was really cold inside the school. NIKKI MASSIE: And progressively, her texts got a little bit more desperate sounding, with the last one saying that she couldn't feel her feet at one point. And I texted her back, and I said, are you joking? And she says no. MADDEN: Massie says her daughter has been cold at school before. It's an old, drafty building. But this - this was different. MASSIE: She wrapped herself in a blanket as soon as she got home. And she stayed that way. And she actually sat on our sofa right next to the heating vent literally until it was time for her to go to bed at like about 10 o'clock. MADDEN: That night, parents in the district heard from administrators for the first time. The email said they were working on the problems. The next morning, Massie's daughter felt sick. And there was a crucial question Massie needed answered - would there be heat in her daughter's school that day? She had a tough decision to make. City, as the school is known, is academically rigorous, and the workload is intense. MASSIE: Do you keep your kids home and risk them falling behind versus sending them into an environment that - you know, I wouldn't put my worst enemy in a building that was unheated in this weather. MADDEN: Sixty schools out of the 180 were open but without fully functioning heat this week. At Frederick Douglass High School, a burst pipe and fallen ceiling tiles destroyed numerous MacBooks and technology equipment for teaching kids to become EMTs. Dennis Morgan is a senior and says he's freezing. DENNIS MORGAN: As of now, I have on like four shirts, two hoodies and a jacket - right? - and it's kind of hard to get comfortable when you got so many layers on. And you're not used to it, and you're still cold. MADDEN: He says teachers are sharing their scarves with students. MORGAN: We have teachers and our principal trying to help us. But Baltimore City Schools doesn't. They don't really listen to us. MADDEN: Soon after we spoke, his high school was dismissed early. Yesterday, the Baltimore Teachers Union called on the district to close all the schools until the facility's crew could fully address the problems. City Schools CEO Sonja Santelises spoke to the public on Facebook Live. She said the operations teams worked through the holiday break, and they thought they were in good shape. But Monday night was another brutally cold evening, and that took its toll on the old infrastructure. SONJA SANTELISES: We had schools that were cold yesterday that were warmer today. The challenge was we had new schools today that were facing heating challenges. MADDEN: The city is in the middle of building 26 new schools. But that will only help a fraction of the students, she said. The forecast looks like it's only getting colder. Santelises emphasized that, if needed, she will keep closing individual schools. Mom Nikki Massie says it makes it really hard to plan. However, she did get a robocall. It said student progress reports are in. But there was no progress report on the heat. For NPR News, I'm Mary Rose Madden. (SOUNDBITE OF MICHITA'S "INNER MONOLOGUE (INSTRUMENTAL)") Transcript provided by NPR, Copyright NPR.